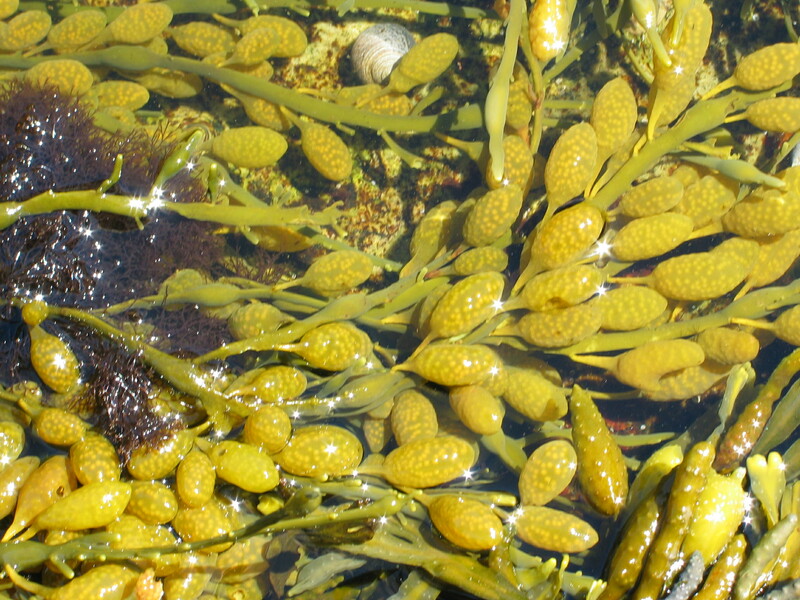 Rockweed (Ascophyllum nodosum) reproductive receptacles. For volunteers having access to the shoreline, Coastal Signs of the Seasons is an opportunity to provide scientists with information on an ecologically and economically valuable species. Coastal observers measure the growth and development of the brown alga, Ascophyllum nodosum, which is commonly called “rockweed” or “knotted wrack.” Seasonal reproductive changes in this species are affected by environmental conditions, such as water temperature. By closely monitoring this rockweed, as an indicator species, researchers are able to examine changes in the intertidal zone that may affect other species that live there. A lot of information can be gathered through coastal monitoring, but there is also a lot of New England coastline to monitor. The diligent efforts of many volunteer observers can combine to create a robust data set for our collaborating scientists. We invite you to become a citizen scientist observer by monitoring rockweed in your area. Training and equipment are provided. Please read on for more information and contact us to register for a training session. 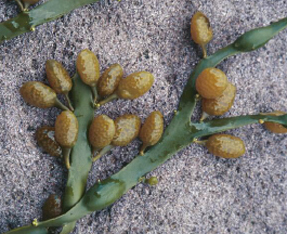 Ascophyllum nodosum, more commonly called Rockweed, is species of brown algae or seaweed that is found along the New England coast. It grows on available hard surfaces, including rocks, shells, and dock pilings. Rockweed averages in length between 20-30 inches and can be much longer in areas where its growth is not restricted due to high wave action and breakage. Why choose this indicator species? 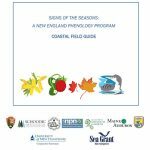 Signs of the Seasons: A New England Phenology Program Coastal Field Guide (or download the PDF): Our training and field observation handbook shows you how to set up your observation program for the rockweed species, Ascophyllum nodosum. Includes information on how to record your observation data. The handbook provides detailed information on each step, as well as additional resources to help you get started. Already trained? Plan to travel out to your site at low tide to observe Rockweed phenophases throughout the season. Bring along a Phenophase Datasheet to record both the phases and the water quality. Once a year, usually in the spring, plan to also complete an Age and Growth Assessment at your site. Age & Growth Data Sheet: Procedures B & C (PDF) (Note: datasheet has been updated for the 2019 collection season, which begins in March). Click HERE for a link to the Anecdata website. 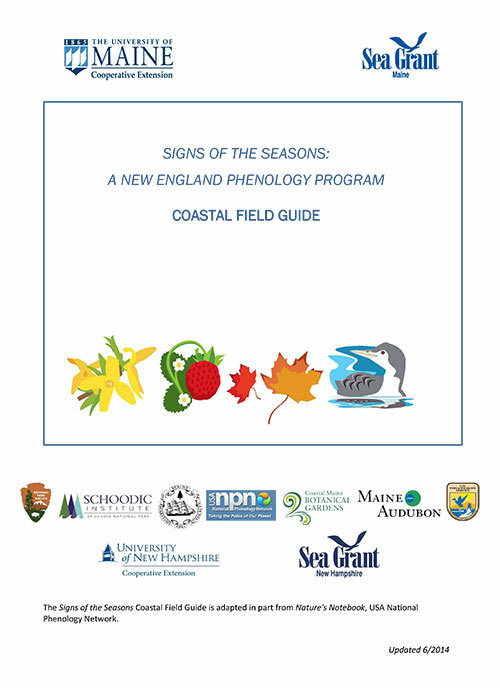 Curious about how your coastal phenology data is being used? Check out our webinar (below) where Signs of the Seasons collaborating scientist Dr. Jessica Muhlin from Maine Maritime Academy outlines the importance of Ascophyllum nodosum (rockweed) and gives an update on her rockweed research and findings.